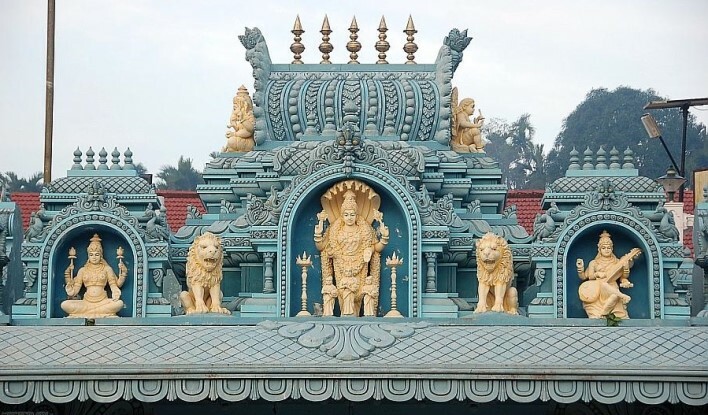 Annapoorneshwari Temple (Annapurneswari Temple) in Horanadu is located on the banks of River Bhadra in District Chikmagalur of Karnataka. Situated in the dense forest and valleys of Western Ghats, Annapoorneshwari or Annapurna is a Hindu goddess of nutrition and food. The literal meaning of Annapoorneshwari is “Feeding one and all”. Anyone who visits this temple is offered meals and shelter within the temple premises. 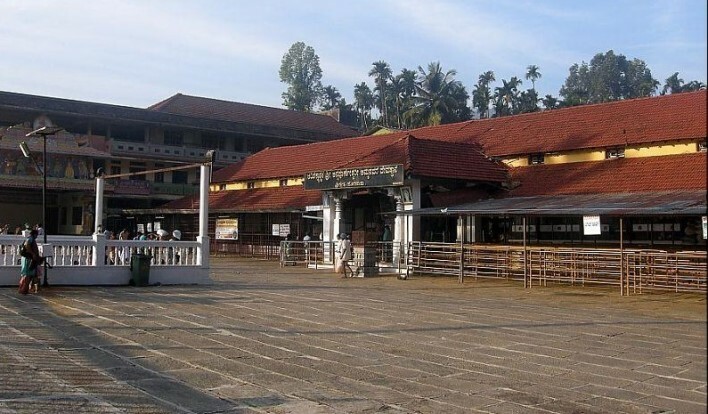 The temple is also known as Sri Adhishakthyathmaka Annapoorneshwari or Sri Kshetra Horanadu Temple. it is believed that Maharshi Agasthya in 8th century did the prathistapana (established) of goddess Adishakthyathmaka Sri Annapoorneshwari here. As per mythology Lord Shiva and Goddess Parvati had an argument. Lord Shiva declared everything in the world including food to be Maya or illusion. To prove food is not illusion Goddess Parvati disappeared resulting in the nature to become still. Neither climates changed nor plants grew, causing draught in the world. taking pity Goddess Parvati appeared and distributed food to all. And since then she is called as Devi Annapoorna. There is another very interesting myth related with this temple. It is believed that Lord Shiva beheaded Lord Brahma, and his skull got stuck in Lord Shiva’s hand. He was cursed that till the skull is not full of food or grains, it will stick to his hands, Lord Shiva went everywhere and asked for food but the skull was never full. So he finally went to this temple and Maa Anapoorna filled the skull with grains and reversed Lord Shiva’s curse. Hereditary dharmakartharu started in this temple from last 400 years. The same family is serving and preserving the temple since then. 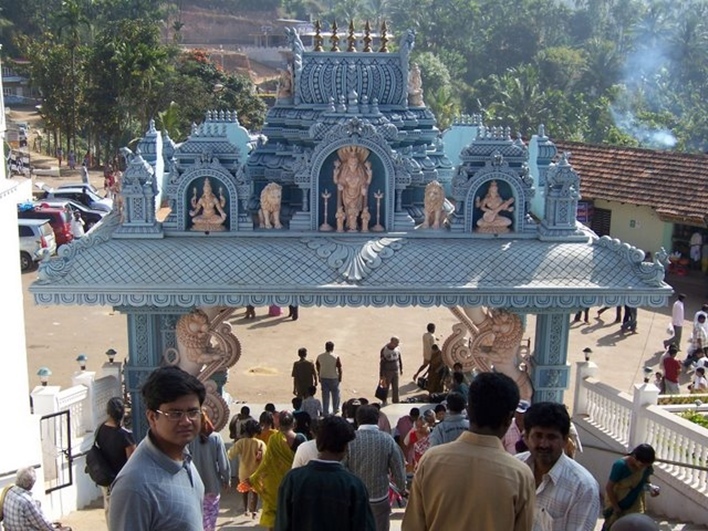 dharmakartharu have played an instrumental role in refurbishing the temple as well as in performing the rituals here. The temple premise was small and unknown to many till the fifth Dharmakartharu Sri D.B. Venkatasubba Jois repaired and revived the Temple following the principles of Astrology, VastuShilpa and Hindu Myhtology. Prathistapana of Devi Adishakthi and ‘punaprathistapana’ of Devi Annapoorneshwari was done in 1973 on the auspicious day of “Akshaya Tritya”. The word Annapoorna is a made of two words Anna meaning grains or food and Poorna meaning perfect and complete. Hence, Annapoorna means complete or perfect food. Sri Annapoorneshwari is believed to be an incarnation of Goddess Parvati, wife of Lord Shiva. Devi Annapoorna is lauded and appraised in several ancient texts like Rudrayamala, Annapurnamalininaksatramalika, Annapurnamalininaksatramalika, Sivarahasya and Annapurna Kavacha. Goddess Annapoorneshwari can been seen here in a standing pose on a peetha. she is holding Shanku, Chakra, Sri Chakra and Devi Gayatri in her four hands. The idol is covered in gold from head to toe, and it is believed that how so ever visit Devi Anapoorna, will never for without food in their lives. Akshaya Thadige or Akshya Tritya is the main festival celebrated in this temple. This day is believed to be the birth date of Devi Annapoorna. This day marks as the beginning of Treta Yug as well as the end of winters and start of summers. The temple also celebrates 5-day long Rathotsaya during the month of February, 9-day long Navratri during September, Deepotsava and Havi with great enthusiasm. 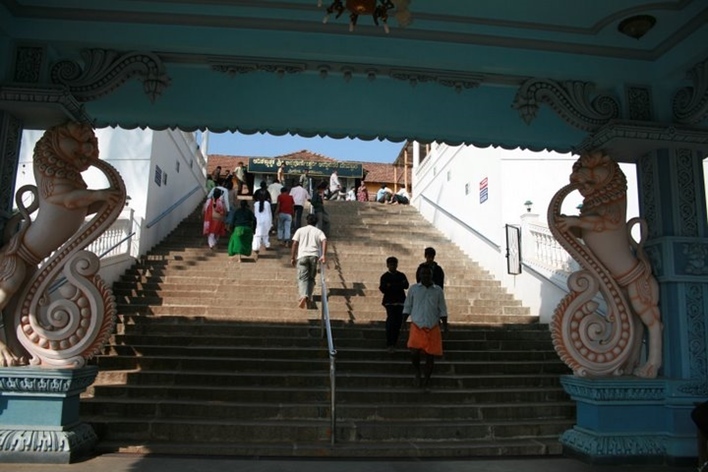 To reach the main temple complex, worshippers have to climb a flight of steps. The Gopuram of the temple is adorned with several sculptures of Hindu deities. 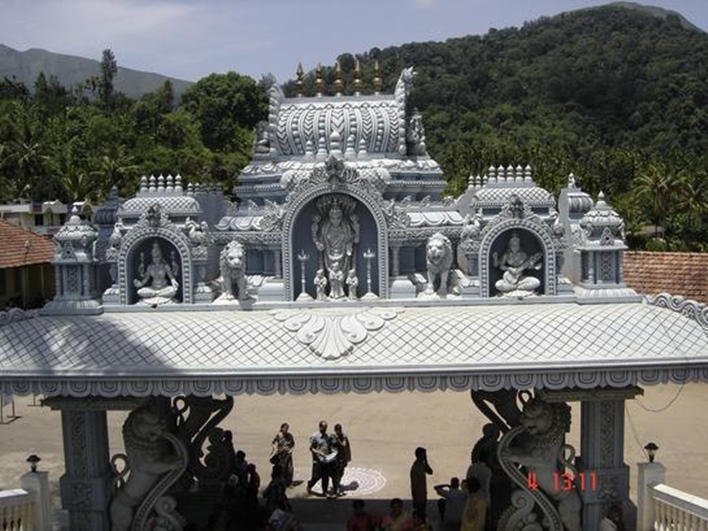 Mandapam is located on the left-hand side of the main temple entrance. Beautiful carvings can be found on the ceilings of the temple. Adi Sesha surrounds the main sanctum or the Garbhagriha of the temple and the Padma Peeta constitutes of Koorma, Ashtagaja and others. The closest airport to Horanadu is Bajpe Airport in Mangalore, Karnataka located 66 kilometers away. It is an international airport well connected by all major domestic and international cities. Mysore airport located 178 kilometers away is the next closest airport. The city of Horanadu does not have its own railway station. the nearest railway station is in Bantawala located 55 kilometers away from Horanadu. One can even reach Kabakaputtur railway station located 58 kilometers. Time taken to reach Horanadu is nearly same from both the railway stations. Horanadu is well connected from all the major cities in Karnataka by KSRTC buses. Several private buses also ply daily services to this city.